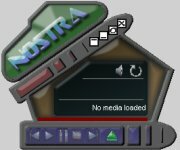 Nostra Divx Player is a complete replacement for the Windows Media Player. It is capable of playing the Divx format as well as other any other Windows audio formats. Its features include a radically different interface, full-screen mode, playlists, subtitles, speed control and VCD support. It features 100% importing of Winamp skins. Nostra Divx Player is dedicated to the people affected by September 11 and named after the prophet, Nostradamus.